Thinking of birthday party ideas for boys as they get older gets a bit tougher. Girls are easy, sleep overs, make overs, pamper parties, shopping. Boys, mmm requires a little more inspiration. So when Fraser said he wanted to go paintballing, I was delighted that they'd all be leaving their X box's behind and heading for some fresh air and exercise agreeing, that it was a brilliant birthday idea. Give a group of boys a gun each and set them loose in a forest, they'll be in their element. Fraser sent out invitations to his friends, who all jumped at the chance immediately. The excitement building up to the day was infectious, and there was certainly a restless night beforehand in our house as the long awaited day dawned. Arriving at TAZBALL PAINTBALL the intrepid soldiers met their Games Master, Taz, who explained how the site worked. They were issued with their kit which included camouflage overalls, full face mask, padded head guard, hopper and battle pack. 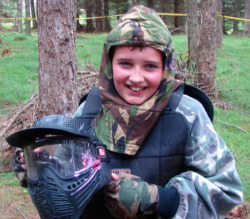 After a full safety briefing including the do's and don't of paint ball, the boys embarked on their battle in acres of stunning Scottish forest scenery. Splitting in to 2 teams they had to devise strategies to complete their mission first to win the game. 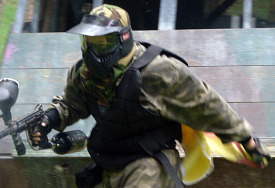 They embarked on series of strategic skirmishes, shoot-outs and struggles to become the paintball champions. Spending the afternoon in action packed warfare. 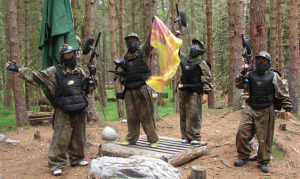 Pumping paintballs at each other to be the first team to reach and raise the flag in triumph. All under the watch full eye of Taz, who was brilliant with the boys. So how did it rate as birthday party ideas for boys? 5 hours later and Fraser was still on a high, recounting each move and shot, proudly displaying his bruises! As a parent I would HIGHLY recommend it. Fantastic fun, and nothing to clear away afterwards. I just dropped them off and pick up a team of exhilarated troopers at the allotted time. 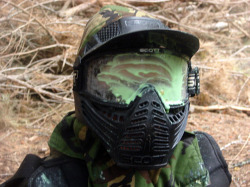 So if you're looking for birthday party ideas for boys I can't imagine a better day out than paintballing, and neither can they! So much was it enjoyed, Fraser's washing cars and saving all his paper round money for membership and his very own paintball gun. I really can't think of a better hobby, it certainly beats watching TV and the X box!